Can A Clogged Vent Cause A Toilet To Overflow? 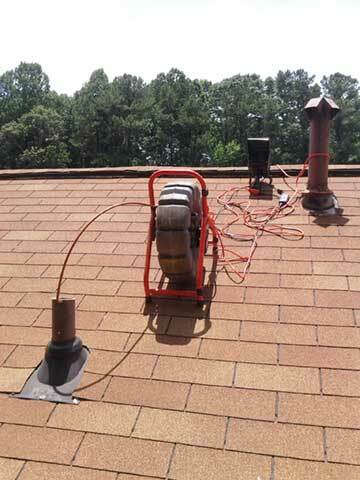 Sewer vents are located on the roof of your house. They allow the gases that build up in your sewer system to escape. So, the question then is can a clogged vent cause a toilet to overflow? If a vent that is attached to your sewer system and your toilet is clogged, it can cause the toilet then to drain slowly and demonstrate the same symptoms as if there was a clog in the toilet - which means that yes, the toilet could overflow due to a clogged vent. If your vents are not covered properly, it's very feasible that leaves, bird nests and other types of debris could get lodged in there and create a clog. Slow drains - As I mentioned earlier, if a vent is clogged it can cause the fixtures attached to that vent to drain slowly. This is a very common telltale sign. Toilets make a gurgling sound - A clog in the vent restricts airflow through it. As a result, the pressure in the pipeline then increases so when you flush the toilet, the water has trouble going against this pressure and the result is a gurgling type of sound. A strong sewer smell - Because the clog is causing an increase in pressure in the pipeline, gaseous odors are also blocked from flowing out of your home. Work on a vent pipe is very difficult and if it involves getting on the roof, potentially very dangerous. It's strongly recommended that you contact a professional plumber if you suspect that your sewer vents are clogged. If you have any questions about your plumbing vents, call the Atlanta plumbers - Atlantis Plumbing today at 770-505-8570. We are available 24 hours a day, 7 days a week.